Preventing injury and recovering from an injury creates many issues and problems, especially when you want to continue to stay active and lead a healthy lifestyle. You don't want to make the injury worse or place any added pressure on a muscle or tendon while in rehabilitation. So how can you recover from injury and still be able to train and stay active? Jen McIntosh contacted Anytime Leisure as she was looking to overcome her own injury troubles. Her coach had suggested that she should incorporate one of our Spin Bikes in to her daily training routine. 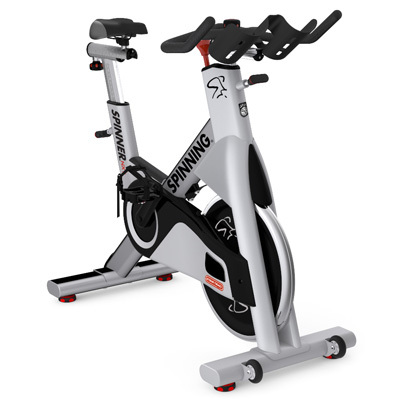 The spin bike would offer her a low impact, high intensity workout and wouldn't put any further stress on her injury. 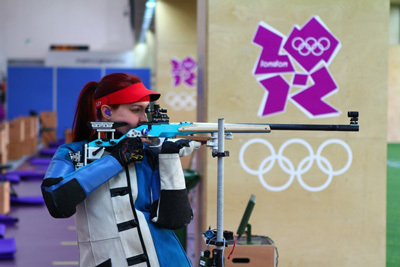 Jen is a Scottish and British rifle shooter, and competed at the London 2012 Olympic Games where she unfortunately sustained the injury. Anytime Leisure supplied Jen with a Star Trac NXT Spin Bike to assist with her recovery in the run up to the Glasgow 2014 Commonwealth Games. Jen tells us that she's never been to a Spin Class before using the spin bike, but the Star Trac commercial spin bikes were recommended to her by her coach. "It’s been great," says the athlete. "It’s much better than using a normal exercise bike because it’s so much more like riding a real bike." "The bike itself is excellent and arrived at the door pretty much ready to ride once unpacked," she explains. "A few quick adjustments to get the fit right and it was all set. Coupling the bike with the Spinning Computer and a heart rate monitor and you have an extremely effective training system." "Using this setup makes it very easy to control and monitor the level you are working at and also provides a relevant set of data that you can record over time to track your progress," Jen adds. Jen says that physical and aerobic fitness is "surprisingly important" to her sport. "Most people underestimate how physically demanding shooting is but it’s essentially an endurance sport – some matches last over three hours – and the mental demands of concentration can be fatiguing as well so you have to be fit to be able to maintain concentration and deal with the nerves." The athlete says that having an NXT Spin Bike really helped to get individual training sessions in. "It’s much easier to fit in my training sessions when I can just get started in the morning," Jen explains. "It means I can do longer sessions too, meaning I’m getting more benefit, faster." "I try to use it almost every day but at least a minimum of three/four times a week," Jen says. "I use it for doing almost all my CV workouts at the moment. Because I’m in the middle of competition season now, my time is even more limited so it’s been such a great help!" In terms of a sample training session, Jen says she "likes to keep it simple and do a lot of steady state training" with the goal to maintain a steady heart rate for around an hour. "But I also do shorter, more intense sessions doing intervals to compliment that." "I’m better able to deal with the physical demands of the sport now than I was, even a year ago," Jen adds. "I didn’t have a great base level of fitness before so my physio and strength and conditioning coach were a little concerned that I might injure myself on say, the rowing machine. But I’ve always enjoyed cycling and that obviously helped with motivation (you’re more likely to actually do something if you enjoy it) so it seemed like the best place to start." Jen says she'd "definitely" recommend other athletes to get the equipment they need to aid their recovery process. "The service and support of Anytime Leisure has been second to none," the athlete says, "and I look forward to working with them again in the future." This entry was posted in Knowledge & Advice, Training Guides on 28th June, 2013 by Craig Fleming.